At the entrance of Valletta, next to the new House of Parliament, stand the ruins of the Royal Opera House. This ‘Teatro dell’Opera’ was built in 1861 on the site of a demolished house, known as ‘Casa La Giornata’, the residence of the Turcopilier of the Auberge d’Angleterre (English Auberge). There were several reasons which led to the building of a new Opera House at Valletta. The Manoel Theatre had become too small to house an ever increasing number of people. 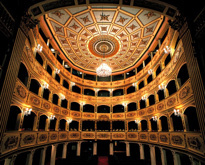 The Manoel’s stage became too small to stage certain type of operas such as those of Rossini, Donizetti, Puccini and Verdi. The number of tourists visiting the island was increasing, some wanted to visit this theatre for an opera night. The need for a new bigger theatre was being felt and an English architect Edward M. Barry was chosen for the project. The facade of the Opera House was typically Corinthian and it had a colonnade on all its sides. Its cost amounted to £60,000 which was a huge sum of money at the time. An attraction of this theatre was the salon, which was placed over the entrance hall. This hall was lit by five large windows. The theatre’s painting-room and the workshops were on the roof. As the Opera House was one of Valletta’s attractions, the local government tried its best to manage this ‘musical heaven’. The day to day running was left in the hands of a committee which was appointed by the government of the day. By time the new theatre started to be very popular with both the Maltese and the families of the British servicemen who were stationed in Malta. The village elite used to dress up in their best attire and hire a ‘karozzin’ (Maltese traditional horse-driven coach) to take them to Valletta to watch an opera at this theatre. The Royal Opera House opened on the night of 9 October, 1866, with Bellini’s famous opera ‘I Puritani’. Month after month, year after year, the opera seasons went on uninterruptedly, even during the First World War. There was only one exception; that is a brief interruption from 1874 to 1877 following a fire. This incident had destroyed the theatre’s interior fittings and decorations. 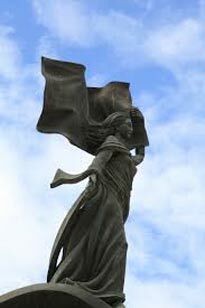 It was reopened on 11 October, 1877, with Verdi’s new opera Aida. The theatre became more beautiful with boxes in five tiers and a pit which could accommodate more than 1,000 persons. The Second World War brought the end of a long story of famous operas, composers’ visits and resonant voices. During this great war, one direct hit from an air attack brought the theatre to its knees. There were many attempts to rebuild the Royal Opera House. In the end it was decided to convert the site into an open-air theatre known as Pjazza Teatru Rjal. During the times of the Knights, plays and theatrical productions were generally held in the great halls of the auberges. 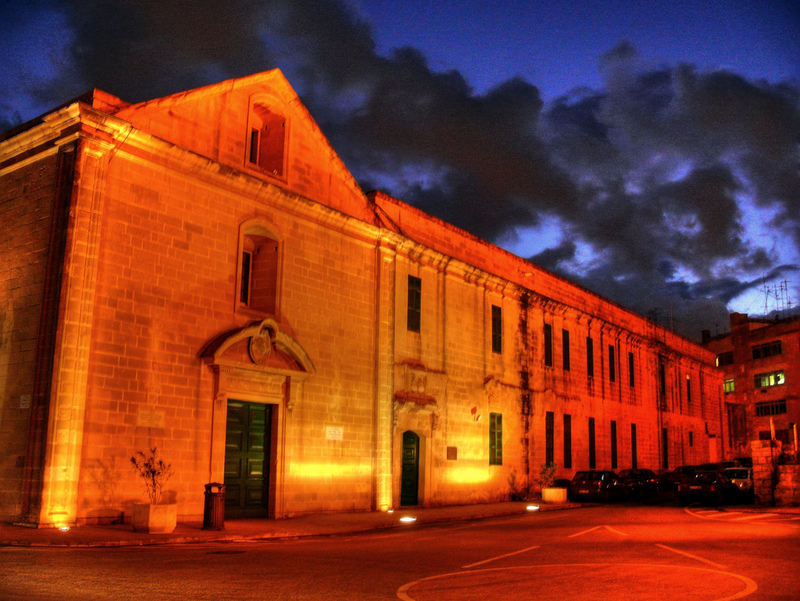 Valletta was in need of a court theatre. This problem was finally solved when Grand Master Antonio Manoel de Vilhena acquired a site from the Priory of Navarre for the sum of 2,186 scudi. It was modelled after the plan of the contemporary Palermo theatre ‘for the honest recreation of the people’. The design is attributed to Romano Carapecchia. Work on the theatre started immediately after the signing of the deed of purchase and it was completed in the short period of ten months. The theatre was given a very simple facade. It had special accommodation for the actors who were generally brought over from foreign countries at the expense of the impresario. The theatre opened its doors on 19 January, 1732, with a performance of Merope by Maffei. Two well known impresarios were Melchiorre Prevost Lanarelli and Giovanni Le Brun. From 1768 to 1770 the impresario was a woman, Natalia Farrugia. During the times of the Knights, the Grand Master appointed a person who used to supervise the management and the theatrical productions. In 1783 the theatre underwent some modifications and redecoration. Natale Marini sent Comm. Scozzini, one of the commissioners of the theatre, a plan and a model of the interior. This included the stage too, as well as scenery and illumination. When the model was displayed before the Inquisitor and many senior members of the Order (Grand Crosses) and Knights, their comments were very positive, so much so that the commissioners decided to add a further sum of money as bonus to the 49 scudi requested by Marini. The top balcony and the boxes which are housed near the stage were added during the early nineteenth century. This theatre includes a museum. It houses a collection of early librettos, a portrait of the theatre founder and some machines used for theatrical productions. One of the attractions of this museum is a rotating display of stage costumes drawn from the theatre’s large collection. A case in point is a scarlet costume and accessories which were used for Verdi’s opera Rigoletto. Other beautiful costumes include a purple dress used for Giordano’s opera Fedora and a girl’s costume used during a nineteenth century pantomime Alice in Wonderland. Both the museum and the theatre are open to the public. 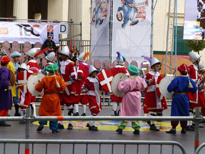 In former days, on New Year’s Day (l-Istrina), the Maltese used to give money gifts to the young members of the family. The well-to-do families also used to give money gifts to their domestic servants as well as to other people who rendered them a service throughout the year. The Maltese used to give great importance to New Year’s Day lunch. In the past, many Maltese preferred to have fish for this meal on New Year’s Day. Fish was considered, by the Maltese, to be an augury of good luck. Whilst trying to include fish, they also tried to exclude hotch-potch soup from this lunch as they believed that those persons who ate this type of soup would grow ham bones for the rest of the year. Another belief which concerns this day’s lunch is a warning for those who eat cabbages on this special day. According to this belief, these people would groan for a whole year. Family members were expected to be present at lunch-time on this particular day. It was held that those who absented themselves would die by the end of the same year. The importance of fish on the first day of the year died out. Due to British influence, fish lost its place of honour. It was taken over by the turkey. New Year Day’s lunch became very similar to that of Christmas Day. It included soup and ‘timpana’ (a locally made pasta dish). Turkey was served with potatoes and vegetables. White Maltese wine dominated the New Year Day’s lunch and for sweets there were either Christmas pudding and mince pies or Maltese sufflè. Nuts also accompanied the day’s sweets. Usually there was a guest or two invited for this special lunch. There was a custom among Maltese families, to invite a brother’s or a sisters’ family for lunch for Christmas day and this brother or sister and their partner would reciprocate this gesture by inviting the host family for New Year’s Day. Unmarried siblings were also invited for this lunch who would usually turn up accompanied by a widowed mother or father. When the guests arrived, they used to give money gifts to the children of the host family, who placed these gifts inside a wooden box. The children were expected to wait till lunch was over and guests to leave, to open their wooden boxes and count the money they would have received. A large sanctuary stands on a hillock in the locality known as Ta’ Għammar, half-way between the Gozitan villages of Għarb and Għasri. This sanctuary has a particular story to tell. It started with the building of a small chapel by the Gentili family, dedicated to the Assumption of Our Lady. Around 1592 this chapel became the property of Filippinu Gauci who repaired it and commissioned a new titular painting. The chapel started to be know as ‘Santa Marija ta’ Pinu’ (Pinu is a name which orginated from Filippinu). Many people got to know about this story and rumours started to be added. The church authorities wanted to put an end to these rumours published the true story in a diocesan newspaper. People started visiting this chapel. Priests began celebrating Mass from under a canopy which was erected in front of the chapel. As prayers were answered by Our Lady the offerings increased. Many holy pictures of the titular painting were printed. People started taking some oil from the lamp which was lit in front of the effigy. When they returned home they would anoint their sick with this oil. The Gozitan Bishop decided to build a church next to this chapel. Its foundation stone was laid in 1920. The sanctuary edifice was completed after 16 years. 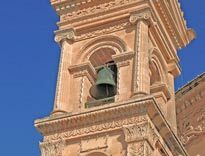 Today this sanctuary is the main Marian church in Gozo. It is still visited by many people asking for the intervention of the Mother of God on their behalf. One of the visitors was Pope John Paul II who said Mass on the sanctuary parvis. In the ceremony he placed a halo of golden stars studded with diamonds around the head of the Marian effigy.